Chelsea displayed a heavily wing-oriented construction game for most of the match with most of their progress in possession being made via the flanks. This was in no small part due to the positioning of the central midfield players Mikel and Fabregas. On many occasions they demonstrated weak co-ordination in their movements at times both dropping into the defensive line in their attempts to assist the home side’s build-up. While this ensured they had enough players in the first line to outnumber City’s 2 man first line of defence, it meant that progressing past this line centrally was very difficult to achieve. On many occasions they were left with only Loftus-Cheek and Costa as central options to progress which City were easily able to mark. Furthermore the lack of support they would have upon receiving the ball would have become major issues and would likely have led to several turnovers of possession which added to the reluctance Chelsea displayed in passing into these areas. With little or no viable options to progress Fabregas and Mikel were often forced into using the full-backs in deep and wide positions during their build-up. This is an inherently unstable approach to building up due to the presence of the touchline and the subsequently heavily reduced rotational possibilities available. With literally half of the angles to move into cut off, a team or player become far more predictable and thus easier for the defending team to control and defend against. These issues in their build-up translated naturally into offensive problems for the home side and they spent much of the first half trying to create chances from wide areas. Once they did make their progressions via the flank their lack of central presence meant they struggled to form connections to move the ball back into the middle. The connections they did establish to move away from wide areas were often created by playing backwards, at times to the defenders which did not trouble City and resulted in several long periods of build-up with little effect. Furthermore their positioning often meant the only available options for the defenders upon providing connections from wide areas were to the opposite side which essentially only challenged City to shift from side to side which was not too difficult. 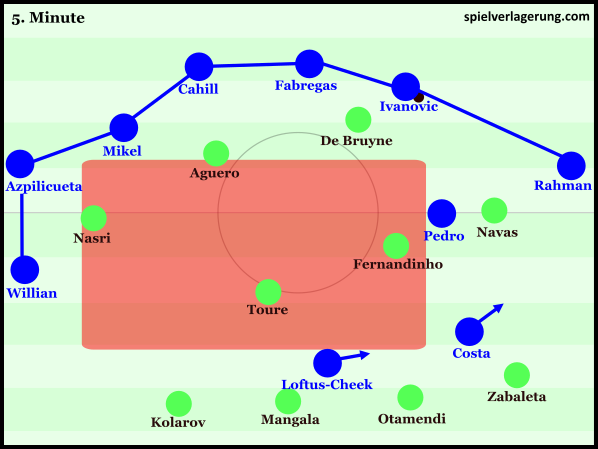 City often suffered from similar build-up issues with both Fernandinho and Toure acting in deep positions leading to quite a wing-oriented build-up phase. Where they differed, however, was how they created connections from the wide areas. On several occasions City managed to shift their attacks back into the centre, with players on the move providing connections their momentum often took them past direct opponents. Furthermore it was often midfield players or full-backs moving through midfield that created the connections giving them a quicker circulation speed than Chelsea. Circulating possession directly through their opponents’ block gave City the potential to draw pressure from Chelsea and create space in ball-far areas. This showed one of the positives of players positioned in midfield giving connections as opposed to defenders. When a team can move the ball from a wide area back into the middle directly through the opponents’ midfield most defensive teams will attempt to collapse on the ball in an attempt to prevent central penetration which is often the ultimate goal. If the team in possession can evade this incoming pressure they can access the space the opponents’ press creates through a simple switch. Circulating possession directly through an opponents’ midfield therefore gives the offensive side an opportunity to manipulate their opponents’ defence and create good offensive possibilities. However if a team constantly rely on the defenders as an escape route from wide areas the process of building can become drawn out, repetitive and ineffective. It can be particularly ineffective due to the lack of reactions it evokes from oppositional defences. This is especially the case because several defensive teams are content to lack access instead aiming to prevent the ball penetrating their block, they will therefore view such passes as a success on their part. Chelsea’s defensive organisation was characterised by inadequate distances and therefore poor support in defensive actions. This was in no small part due to the man-oriented nature of their strategy. One characteristic of good defending is using the support of the team members to create a collective stability in defence which has a multiplying effect on the defensive abilities of the individuals involved. With a man-marking strategy however a team takes an individualistic approach whereby the focus on coverage of opponents often means the team relies heavily on the individual defensive abilities of the players. The home side’s wide players in particular were noticeably assigned a man-marking role on the opposing full-backs. With both wingers at times moving wide and deep, Chelsea’s ability to defend the centre and half spaces in particular was practically compromised with a midfield line at times consisting of two players. Furthermore Fabregas and Loftus-Cheek were often positioned too narrowly and this weak spacing further reduced the size of the midfield that Chelsea could control. While the responsibility to create access in the half spaces often fell to Chelsea’s full-backs, the away side’s wide players supported possession in fairly deep positions making Azpilicueta and Rahman wary of following them out. The result was a lack of access for prolonged periods and City could circulate possession in Chelsea’s half relatively unopposed. This also had an adverse effect on their ability to defend against City’s full-backs despite access to them being prioritised over a compact defensive shape. With simple ball circulation City could create 2v1 situations on the flanks from where City could simply commit their opponents and release Kolarov, Zabaleta or Navas down the flanks to create cut-back and crossing opportunities. 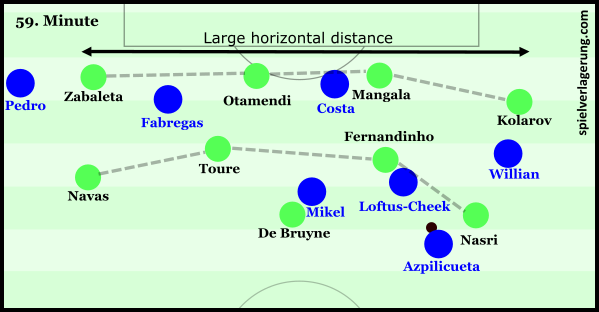 Pellegrini’s side’s structure was flawed due to their passivity in addition to sub-optimal distances between players with a noticeably poor level of horizontal compactness. In defensive phases City were often very passive and struggled to maintain a consistent line of defence from which they began to press Chelsea. With this lack of pressure they struggled to direct Chelsea’s build-up in the manner they desired, and if not for Chelsea’s poor positioning they would have experienced more issues. This passivity was compounded by their poor horizontal compactness. Whilst a passive defence is not ideal if one wishes to force turnovers it is not an inherently weak defensive strategy in absolute terms. Its major strength however lays in its ability to restrict the quality and to an extent the quantity of chances an opponent can create. If a team do not press to restrict options they must maintain good distances between players to exert control of their chosen areas otherwise their opponents will not only have space but easy possibilities to penetrate a team’s block. Optimal distances between players in all directions are therefore crucial in order to access the strengths of a passive system. City were also quite poor in this regard with their block often very stretched horizontally opening up several vertical routes of progression for Chelsea, fortunately for City Hiddink’s side were often too poorly positioned to take advantage. With a game lacking somewhat in tactical nous and both sides largely incapable of exerting a high level of control over proceedings their approach to transitions were vital in the outcome. Chelsea’s aforementioned struggles in their positional structure had predictably adverse effects on their ability to defend City’s counter attacks. In the above image their offensive positioning lacks staggering and proper spacing which will not only harm their ability to manipulate City and create chances but also their attempts to defend the counter. With 6 attacking players practically all on the same horizontal line in offence and the rest of the outfield players around the halfway line Chelsea’s team is essentially split into two. Their lack of spacing negates counterpressing as a feasible strategy and the large disconnect between the sub-units of the team gives City room to create momentum and attack Chelsea’s back line directly at speed with no opponents to slow them down. The non-existent staggering of attacking players and large disconnections between the sub-units of the team were a feature of Chelsea’s game with the same issues appearing on a number of occasions. Only a few last ditch tackles prevented City from taking advantage of these situations and building an imperious lead early on in the contest and it was of little surprise when City eventually took the lead on the counter attack. 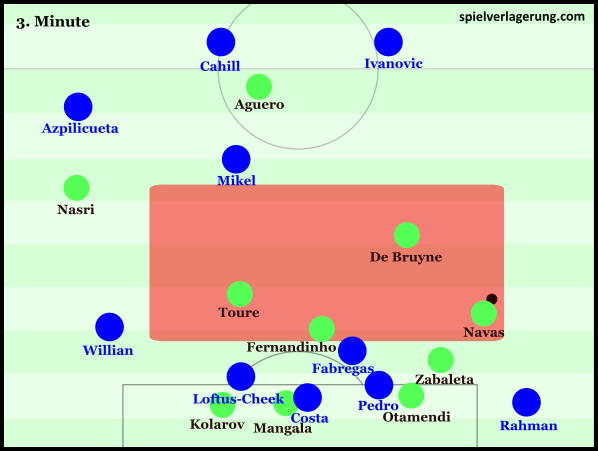 While Chelsea’s inability to defend transitions gave City a relatively easy job when it came to counter attacks, they still executed them fairly impressively and they picked out vertical or diagonal runs precisely and directly behind the home defence with De Bruyne and Nasri both having clear chances as a result of these. 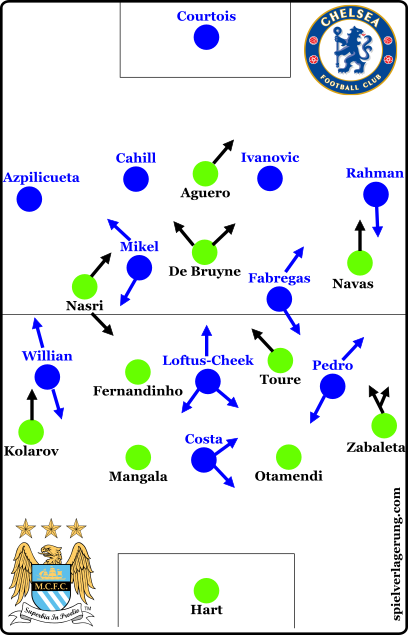 Manchester City’s approach to defensive transitions was, rather sensibly, heavily dependent on the situation. In situations where they had favourable numbers in the vicinity they would counterpress with the forward players particularly ball-oriented aiming to force an action. There were of course other cases where they were fairly weak around the ball and in these situations they attempted to drop collectively and regain their defensive positioning. At times this created some issues for the away side as they were too slow to recover their positions and lacked access to the ball to slow down Chelsea’s counter attacks. City did improve in this respect after the interval and when they managed to force Chelsea into deep defensive positions they could easily regain possession, this was partly due to Chelsea lacking outlets to release them from their deep positions. Another factor behind this was the fact that they already had the lead, this meant they had a reduced need to attack and create chances. They could be seen using defensive ball circulation and the positioning of a number of players was visibly aimed at providing stability upon turnovers. This allowed them to exert a greater level of control over proceedings which was an effective way of protecting their lead. Chelsea and Manchester City both displayed some tactical vulnerabilities that go some way to explaining their relatively modest positions in the league. Chelsea however were particularly poor, struggling to make their possession game efficient and lacking control of any defensive phases. City meanwhile were more impressive after the interval as they displayed greater control of the game and ran out convincing winners. With nothing left to fight for Chelsea’s season has been all but finished for almost a month and their resolve to fight back after going behind could be questioned. Chelsea staff, players and fans could be forgiven for willing the season to end and looking forward to starting the new campaign under Antonio Conte. Manchester City on the other hand ended a good week on a positive note after knocking out Paris-Saint Germain on Tuesday. They now have a Champions League semi-final against Zidane’s Real Madrid to look forward to and will be quietly optimistic of causing an upset. With Pep Guardiola soon to join Manchester City fans will be looking to the future with a renewed sense of hope after an indifferent league campaign.